The occult is something peculiar to or characteristic of the human species, irrespective of culture. And, as Malinga has clearly observed and experienced, even within cultures, all social strata embrace it with an equal passion. It is remarkable that one person (the author) has had such a wide variety of experiences of this phenomenon within a span of about 50 years - and from log cabin to White House. As Malinga himself asked me "Is this by itself believable?" 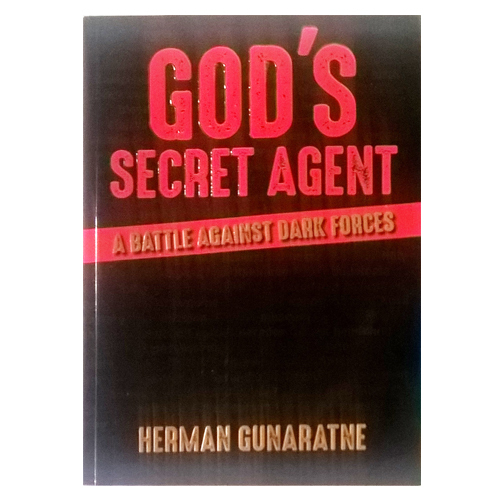 An extraordinarily intriguing tale titled "God's Secret Agent – Battle against the Dark Forces" by Herman Gunaratne was recently launched. The author, in no uncertain terms, observes the peerless spiritual power of the Buddha and Jesus Christ in combating evil or dark powers. In essence, it is a story of good triumphing over evil, rather than a mere foray into the world of dark forces. Herman himself sums up this age-old battle, in the book's preface as "My story is about exorcism and how the power of Jesus Christ and the unseen power of the Buddha were used to combat and nullify evil powers. The exorcist of this narrative was a Buddhist and also a staunch Christian. Indeed, the whole story has a strong Christian flavour. ....I have not witnessed any evil forces or the Devil, but I do have experience of some rather strange events, which have shown me that there is a dark side to this world, for which a rational explanation cannot be given. I have felt the sinister presence of these dark forces. Is it possible to believe something for which there is no rational or logical explanation? That judgment I leave completely to the reader. I am neither an egotist nor a non-believer, and I do not have a theological knowledge of comparative religions." The book is a compelling read, which not only exposes Sri Lankan practitioners of black magic but also the power of the positive forces such as God and the Buddha. Witchcraft is a fascinating subject and articles from the body such as hair, have been used to cast spells or to summon a dark spirit, sometimes with the intention of harming the intended person and other times to control or manipulate that person. There is a fascinating story in which a girl practised black magic on her boyfriend out of desperation to get him to marry her. The couple were never legally married. Aided by the protagonist of the book, a charmed copper scroll was found hidden on the ceiling. "It is extremely powerful, and it will not be the only one in the house, it has the protection of the devil made by an expert sorcerer.